INSPIRED BY DOWNTON ABBEY -- ART IMITATING LIFE OR IS LIFE IMITATING ART? Quite often, I feel truly blessed to be a visual person. No matter how much I read and how many times I read the same thing over, words and letters never resound in my memory as crisply and vividly as do images, colors, and sound. I have always been able to remember time periods and places with color codes etched in my mind and I always seem to find things in the biggest piles of mess, as long as I know what color I'm looking for. I LOVE colors and how well they pair up with each other ... or not, and I simply can't imagine life without color, especially during times of renewal and the coming of Spring seasons! 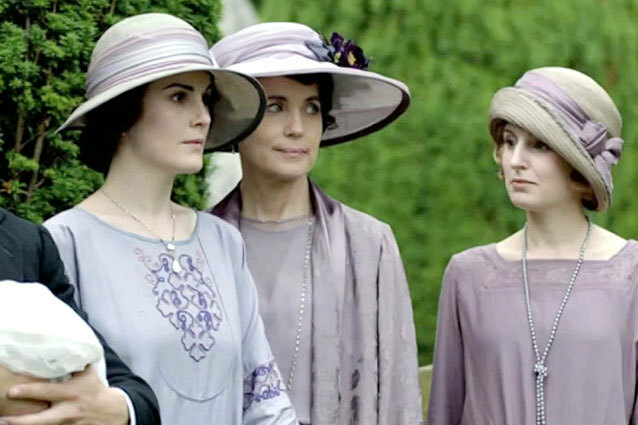 This is one of the main reasons I await, with great anticipation, each new episode of Downton Abbey! Not only are the characters and story lines riveting, but what a feast for sore eyes when one sees the details in costumes, home decor, and the impeccable taste embedded in every pixel on the screen! 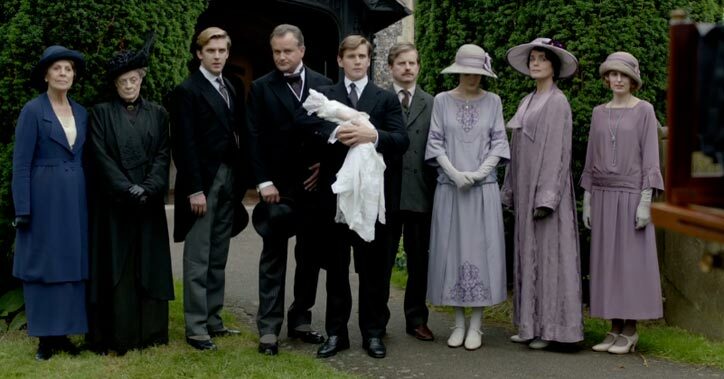 Of particular note to me, in the most recent episode, was the beautiful Lavender or Antique Violet dresses the ladies wore at baby Sybil's Christening. 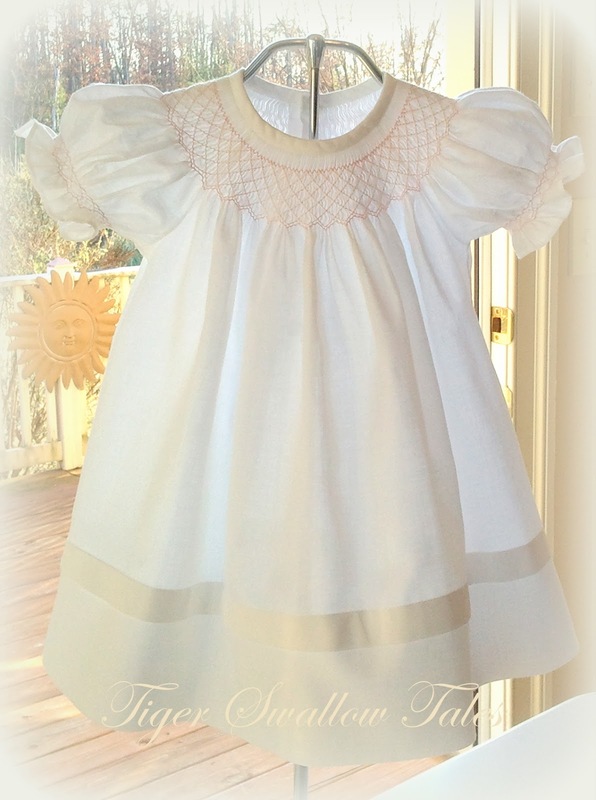 Quite coincidentally, while I was watching the show, I was also custom-smocking this little dress, in the exact same color combination, for a little girl's upcoming dedication. I love working on custom orders where customer's choose color and offer their own ideas in the creation process and I was particularly excited to work on this one. "The purpose of the Smocking Arts Guild of America is to preserve and foster the art of smocking and related needlework for future generations through education, service, communication and quality workmanship." It's hard to believe February is already here. Why, it seems only yesterday I was scurrying around to finish smocking orders for Christmas and my schedule is already full of orders for Easter and June weddings. February is a very special month in my life, in more ways than one. Celebrating my birthday the first day in February marks a day where I feel one step further from winter chills and one step closer to renewal during Spring. With each crocus or daffodil bulb that starts peeking from the ground outside in February and much excitement in force-blooming bulbs indoors, I rejoice with the hope of all things new and fresh coming into the new year. February is a sure month to chase away winter blues, and, to top it all off, February also brings my work to light. It is, after all, the month designated as National Smocking Month! As a self-taught smocker, for the most part, I could never have mastered everything that is involved in smocking without all of the embroidery and sewing skills I learned from my mother (something worth writing about separately). But, in great part, it was looking into the Smocking Arts Guild of America and becoming a member of my local Chapter that made me fall in love with this beautiful art form all over again and it continues to bring me inspiration beyond anything I ever imagined. I am quite excited and proud, therefore, to be a part of SAGA's mission and grateful for the friendships I gained in that process.